The second in our line of Elemental Cults for the Mongoose RuneQuest (tm) game. Cult of Fire, is a new cult for players and NPCs. This supplement provides a background for the cult and quite a few new spells, both Divine and Rune. Enjoy. Buy it now in pdf format for only $2.50. Seraphim Guard is pleased to present our latest offering for d20 OGL as part of our plain wrap supplement line. Order of the Hanged Ones is a 6 page OGL supplement that features a new prestige class and details a clandestine group of freedom fighting arcane magic wielders. Check out 'Super Teams Super Bases' by Scott Moore. A great resource for creating complex well-oiled Super Teams and awesome Bases for them to occupy! You can safely purchase the pdf for only $6.25 from our paypal powered shop. 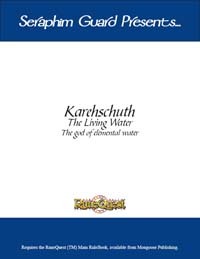 An Water Elemental Cult for Runequest. Offering a background on the cult and many new spells. Plus a very interesting creature! We hope you enjoy it. A companion to the Fire Cult for RuneQuest. Look for other Elemental Cults soon.